Passport Photo Place provides photo services for individuals submitting F-1 OPT application. We take and print OPT pictures that fully comply with photo requirements as specified by the U.S Citizenship and Immigration services – Department of Homeland Security. As of 2019, Optional Practical Training (OPT) application requires professionally printed photographs at this time. USCIS advises to use professional photographer for taking OPT application pictures to avoid issues in processing of an application. 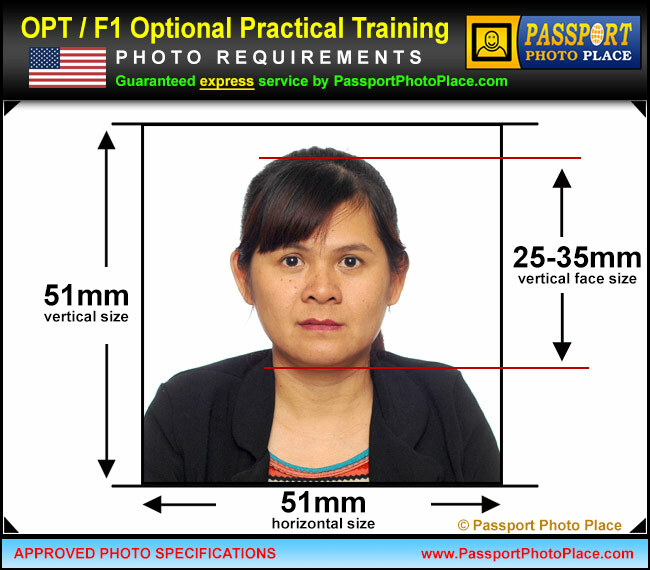 Passport Photo Place produces properly taken and printed photographs that are specifically designed to be used by the eligible F-1 students who intend to apply for Optional practical training permission. Guaranteed OPT picture service. Avoid Rejects! All Optional Practical Training photographs are produced by the strict specifications as defined in OPT application checklist. All OPT/F1 pictures are taken and printed immediately at the appointment time with no further delays. The general photo session appointment length is 15 minutes. At the end of the appointment, an applicant receives OPT photographs. are taken and printed by a professional photographer that specializes in legal photo services. Passport Photo Place makes photos that not only fully comply with OPT photo specifications, but look great, while providing a natural applicant representation. Our studio utilizes the latest document photo technology that is specifically designed to produce high quality and professional looking photographs that are 100% compliant with legal documentation application requirements. Pictures must only be produced by a professional photo studio that specializes in legal document photography. Pictures taken at other than a professional photo studio place can be rejected. The background must be plain white, evenly lit with no background shadows from the subject. Proper contrast is required to differentiate background from the applicant’s facial features. The applicant must wear a normal street attire. Uniforms and any clothing that shows emblems is not acceptable. Prescription glasses, hearing devices or wigs that are worn on a daily basis should be worn in the picture to properly depict the appearance of the applicant. Tinted glasses on the other hand cannot be worn, regardless of the prescription status. OPT/F1 pictures must be printed at 300dpi or higher resolution using a professional photo printer. Inkjet printers are not suitable for printing official photo documents. The photo paper must be slightly glossy and thin. Pictures cannot be retouched or manipulated in any way that alters the subject appearance. Pictures taken and printed by non-professional legal photographer are subject to disqualification. Please wear a solid-colored top/shirt. White or slightly off-white clothing is not recommended as the background for OPT/F1 application photographs is white and there must be a good contrast between clothing and the background. Our Orlando, FL Orange County legal document photo studio is accessible via major routes and in relatively close proximity from the following: Aloma, Altamonte Springs FL, Apopka FL, Apopka, Azalea Park, Belle Isle, Bithlo, Buena Ventura Lakes, Cambell, Casselberry, Casselbery, Celebration Florida, Celebration, Christmas FL, Christmas, Chuluota, Clermont, Cloud FL, Cocoa Beach, Cocoa FL, Cocoa, Conway, Davenport, Doctor Phillips, Eatonville, Edgewood, Fairview Shores, Fairvilla, Fern Park, Forest City, Goldenrod, Gotha, Hiawassee, Holden Heights FL, Hunters Creek, Kissimmee, Lake Buena Vista, Lake Butler, Lakeland, Lockhard, Lockhart, Longwood FL, Maitland, Meadow Woods, Merritt Island and Cocoa Beach, Mims, Narcoossee, Oak Ridge FL, Oakland, Ocoee, Orlando FL, Orlando Florida, Orlando International Airport, Orlando, Orlo vista, Orlovista, Oviedo Florida, Oviedo, Paradise Heights FL, Pine Castle, Pine Hills, Port Saint John, Rosemont FL, Sanford, Sky Lake, South Apopka, St. Cloud, Tildenville, Titusville FL, Titusville, Union Park, University Park FL, Windermere FL, Windermere, Winter Garden FL, Winter Park and Winter Springs.